Greg Haberny,(American, b. 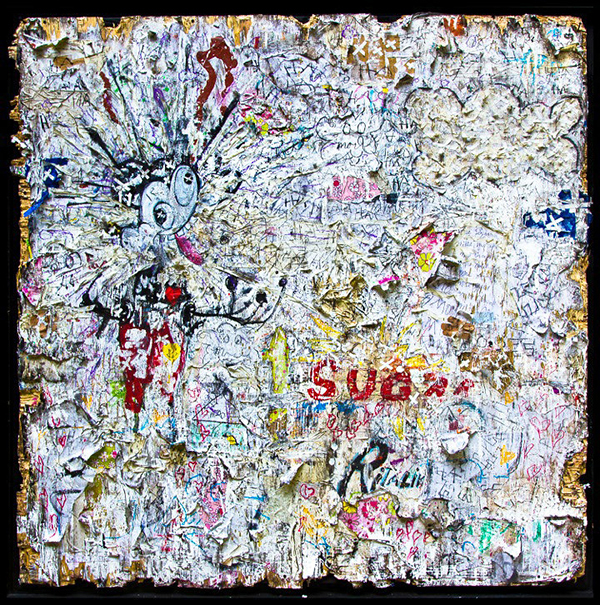 1975), MORE,(feed the monster before it destroys everything in the room), 2013, mixed media on wood, 66 × 66 inches. In an artistic style self-described as “completely loose and out of control,” Greg Haberny uses an array of materials in his work while refusing to conform to a single medium. Melted crayons and Band-Aids add a vital texture to his work, while appropriated images of pop culture, like the iconic Mickey Mouse, create a tone of cultural and political critique.